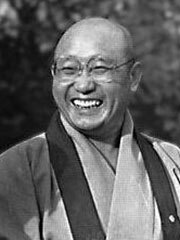 Seung Sahn Soen-sa (1927-2004) was a Korean Zen master born in Seun Choen, North Korea. He started the Kwan Um School of Zen in Providence, Rhode Island. He died in at Hwa Gye Sah temple in Seoul, South Korea. Some of his Zen teachings were recorded by Stephen Mitchell in the book ‘Dropping Ashes on the Buddha’ ISBN 0802130526. Zen Master Seung Sahn is the author of «Compass of Zen», «The Whole World is a Single Flower – 365 Kong-Ans For Everyday Life», «Dropping Ashes on the Buddha», «Only Don’t Know», «Ten Gates» and «Bone of Space».